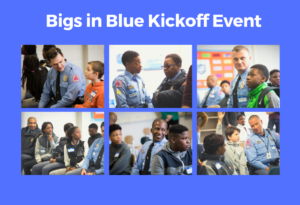 The Bigs in Blue Program seeks to connect youth with police in their communities through one-to-one mentoring. The Program is designed to build stronger bonds between law enforcement and the communities and families they serve. Our goal is to build strong, trusting, lasting relationships between law enforcement and the communities they serve. The police officers and mentee’s will meet once a week at the designated school for a total of four hours per month. Our goal is to serve 15 to 20 children at each Bigs in Blue school based site. The Bigs in Blue program will be a one to one mentoring relationship that will allow the officers to foster positive relationships with local youth and families while simultaneously trying to understand the challenges that children with adversity face every day. During their interactions at school the police will be able to eat lunch with the students, potentially play basketball or other outside activities, as well as play board games, tutor but most importantly spend time talking with their Little. We will utilize our match support team to ensure that our objectives of incorporating the 40 developmental assets into the overall mentoring experience is embraced by the police officers. We will ask for the police officers to commit to the program for at least a year. 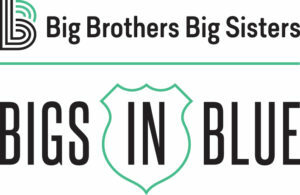 Bigs in Blue was developed by Big Brothers Big Sisters of America, to address the pervasive problem and often devastating consequences of poor relations between police and the communities they serve. We cannot sit on the sidelines,” said Pam Iorio, BBBSA President & CEO. “Many communities suffer from a growing tension between our youth and our law enforcement. As a former mayor, I saw firsthand the positive impact that came from law enforcement officers mentoring young people in Tampa. The program is currently operating in 25 cities, with another 25+ local Big Brothers Big Sisters (BBBS) agencies coming on board soon. National press coverage can be viewed at www.bbbs.org/bigs-in-blue.